How Should I Tune My Conga Drums? what are the preferred keys to play my congas, in a mostly rock format? Of course you can tune your congas to any pitch you prefer. 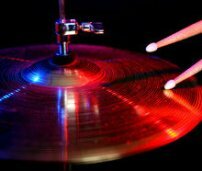 In my opinion, it is more important to consider the sound of the drums themselves than to try to match their pitches to the song being played. have a rich resonant sound when struck with four fingers and then released. This is the most common use of the lower drum. be heard above the volume of the band instruments. Many players prefer to have the drums tunes to the interval of a fourth--the lower drum is a perfect fourth lower than the higher drum. Remember that the exact pitches of the drums must be dependent upon the sound of the drums as described above. One helpful trick that I learned is this: If you transport your drums in cold weather, it is useful to place a small candle under each drum to warm the heads before tuning.